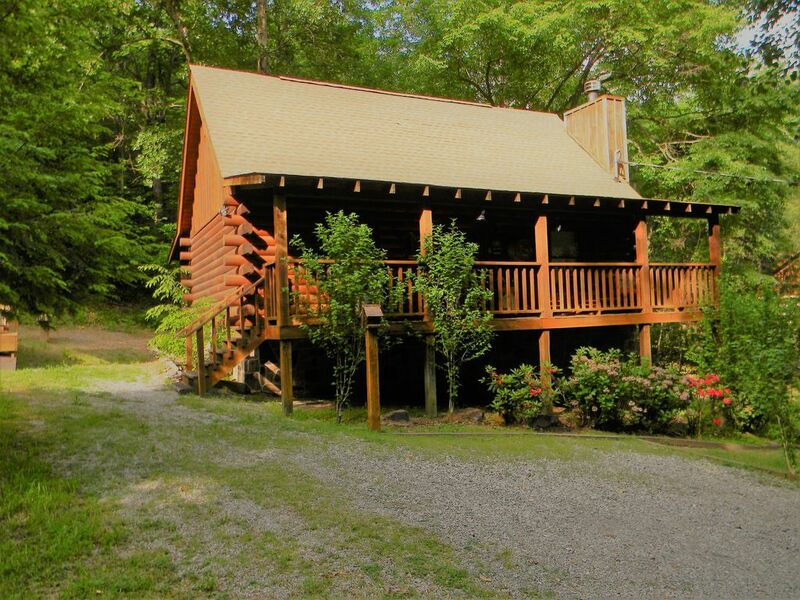 Get away from it all in this cozy cabin located off the beaten path. Destiny's Lodge is a 1 bedroom, 1 bath cabin with 1 King Bed in the Master (new memory foam mattress and box springs in December, 2018), 1 queen bed upstairs, and a sleeper sofa in the living room. Just a few minutes from Pigeon Forge, guests will be close to food, shopping, and entertainment, yet feel they are much further from the hustle and bustle. Destiny's Lodge includes a fully-equipped kitchen, air hockey, foosball, wi-fi, cable tv, DVD players, a hot tub, and a wood burning fireplace. Enjoy country living on the front and back porches in the swing or rocking chairs. It's a perfect place to enjoy your morning coffee or evening cocktail. Come and enjoy this serene mountain getaway. *Photocopy of Government-issued Identification Card (Driver's License, etc) is required for all reservations and will be requested upon acceptance of reservation. This was our first trip to the Sevierville/Pigeon Forge area with the plan to spend a lot of time outside in the mountains. Destiny's Lodge was a great home base after our daily hikes. The little hot tub to warm the aching muscles was fabulous, too. The road down to the cabin is a little intimidating at first, but once used to the winding up and down mountain roads, it wasn't a problem. There are a bunch of cabins around this one, however, we found it to be very quiet and relaxing. Thank you Destiny's Lodge making our family get away one to remember. We are glad you enjoyed your stay. It sounds like you took full advantage of the beauty the Smoky Mountains have to offer! A Fantastic location for a get away Cabin, the owners were fantastic, they answered all our questions ,fixed the bedroom tv that had a loose connection in a very timely manner. Cannot speak highly enough of the cabin and the owners. A fantastic getaway place, we will definitely be back. Thank you again for a great stay. Thank you. Glad you enjoyed your stay, and hope to have you again sometime. We had a great stay. Great beds, hot tubs, furnishings and short trip into pigeon forge. Be sure and follow the given directions and not the GPS as there isn’t much left on some of the GPS roads. Only negative we had is the shower head is really low but other than that great cabin and great owners. Thanks for the review. Glad you enjoyed your stay. The place was nice and quaint. Unfortunately the rain had came down so much we only got to stay 1 of the 2 nights and the night we got to stay the power went out for 2 hours, but the cabin itself was very nice. Everything was clean and well taken care of. We had taken travel insurance but please be aware if you ever are considering it, do not do it. It will only cover your stay if you don’t check in at all. So again nice place but did not get to enjoy the area as we had hoped. Spent almost $500 for 1 night in a cabin with the power out during peak time. Just keep in mind no one can control Mother Nature. Sorry your stay was interrupted by weather. Unfortunately, we do not have anything to do with the optional Traveler's Insurance provided through Vrbo, so I am not familiar with the ins and outs of the policy. I apologize that they would not work with you. Great cabin..great hot tub..cozy setting..couldnt have asked for a better getaway!! This was our 8th year at this cabin..cant wait for next year!! Thanks for your loyalty, and look forward to your return! Cabin was beautiful! We loved our stay. Everything you could ask for. We will definitely be staying again. Glad you enjoyed, and look forward to your return! Payment for reservation indicates that all guests agree to terms and conditions outlined in the rental agreement.